Selecting the right casters for use in your warehouse is a much more important process than some might think. Casters provide the means to make different equipment mobile, which is instrumental to increasing productivity and efficiency for your day-t0-day routine. 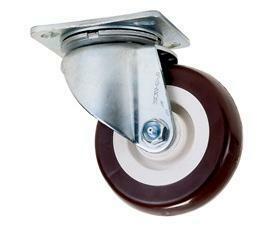 So what do you need to know before choosing the casters that you will use? Read on to find out the top tips for caster selection from S.W. Betz. Perhaps the most important factor when it comes to choosing the right caster is knowing what the potential capacity must be. Different casters support different maximum weights, and so you should be careful to calculate exactly how much the weight of the objects you need to attach your casters to is. Bear in mind how the weight will be distributed, as well; if you have four evenly-spaced casters attached to the base of a piece of equipment, the weight will be spread out over all four. If the balance of your piece of equipment is not so even, then it may be necessary to use higher capacity casters to ensure that it stays supported. The type of caster that you select does not just depend on the weight specifications, but also on how exactly you need the equipment to move. Equipment that needs to roll over smooth surfaces, i.e. ceramic or wood floors, should do so with soft casters so as to avoid scratching or denting the flooring. Hard casters, on the other hand, are probably better suited to warehouse settings or carpeting. There are a wide variety of casters available with features that suit every imaginable purpose; you can select casters that lock into place, casters that are optimized for shock absorbency, and casters that can withstand extreme conditions of heat or cold. No matter what the exact nature of your caster needs is, S.W. Betz has the right caster in stock for you. This entry was posted on Thursday, October 30th, 2014 at 7:55 pm. Both comments and pings are currently closed.